Lead photo © Rick Reinhard. On September 8, the National Museum of the American Indian (NMAI), Teaching for Change, and D.C. Area Educators for Social Justice organized an Indigenous People’s Curriculum Day and Teach-In that brought together more than 100 educators from the D.C. area (and a few from across the country) to share curriculum ideas and strategies for how to teach students about Indigenous People’s history and life today. I learned a lot of sobering statistics on the lack of correct representation in state standards. This experience gave me new ways to re-frame and rethink teaching topics such as tribal sovereignty. The curriculum perpetuates the invisibility of indigenous people. We teach on indigenous lands. . . Remember that! What Does it Mean to Remove a People? Resources shared during each session are listed below. Great introduction to more books featuring American Indians. Helpful rubric through which to examine Native American literature (all literature, really). I learned new ways of talking about Indigenous peoples. I loved thinking about putting Tribal governance in civics education. The website Native Knowledge 360 and materials will be fantastic to use with visual learners. Indigenous peoples throughout the world are on the front lines of climate change — it is a lived experience for them. Rich nations need to support climate change refugees with actions. I’m empowered to understand and review current standards and work in schools that uplift Native current and past histories. Learning about Indigenous women changemakers can inspire students to be changemakers themselves. We need to teach students about Indigenous people today. I learned how to impart content via an art activity like the “maze” book. I gained some wonderful methodologies for instruction about treaties and the nation-to-nation relationship in the US. Participants also shared how they plan to use the information they gained during the teach-in. The resources really excite me and make me feel empowered to bring high-quality instruction into my 4th grade classroom. I will begin to transform the content I expose my students to so they can see more of themselves in the curriculum. I plan to incorporate this information into my lessons and be more mindful and intentional about how I frame things in classrooms. I will incorporate Indigenous subjects into my class and teach students about Tribal governance. Develop and draft curriculum for students in primary school surrounding Indigenous people as a focal point in the fight against fossil fuels. 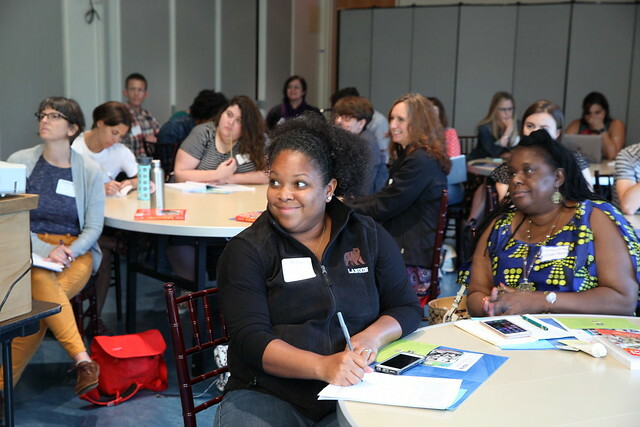 Since the teach-in, educators have planned field trips to the museum with their students, incorporated the resources they learned about into their lessons, and shared the lessons with other teachers at their schools. Save the date for next year’s teach-in, which is tentatively scheduled to take place on September 7, 2019! Below find resources shared at the Indigenous People’s Day Curriculum Teach-In. The National Museum of the American Indian (NMAI) Native Knowledge 360° Essential Understandings about American Indians is a framework that offers new possibilities for creating student learning experiences. Learn more. This online lesson provides perspectives from Native American community members, documents, maps, images, and activities to help students and teachers understand an important and difficult chapter in the history both of Native Nations and the United States. Learn more. NMAI Rubric for Selecting Native American Children’s Literature. Learn More. American Indians in Children’s Literature Reviews. Learn more. Social Justice Books American Indians Booklist. Learn more. The Americans exhibition features nearly 350 objects and images, from a Tomahawk missile to baking powder cans, all showing that Indian names and images are everywhere in American life. This toolkit provides basic grounding in the practice of dialogue. Learn more. This Zinn Education Project lesson introduces students to the broad injustice of the climate crisis and familiarizes them with the issues Indigenous groups around the world face as they confront climate change. Learn more. Treaties, which represent U.S. recognition and reaffirmation of tribal sovereignty and rights, are an important part of our history. In this lesson, students will analyze and contextualize treaties between the U.S. and native nations and explore their aftermath in order to evaluate the impacts of each treaty. View presentation. Additional Resources. It is time to stop celebrating the crimes of Columbus and stand in solidarity with the Indigenous people who demand an end to Columbus Day. View resources for the Abolish Columbus Day campaign, including the popular role-play The People vs. Columbus, et al. This lesson uses painting, collage, and bookmaking techniques to introduce basic facts about the American Shad fish and ways that Native Americans are helping to repopulate this threatened species. Students will consider steps to improve their local environment in their school, home and community. Learn more. For additional teaching resources, see the NMAI’s Native Knowledge 360 website and the Zinn Education Project.